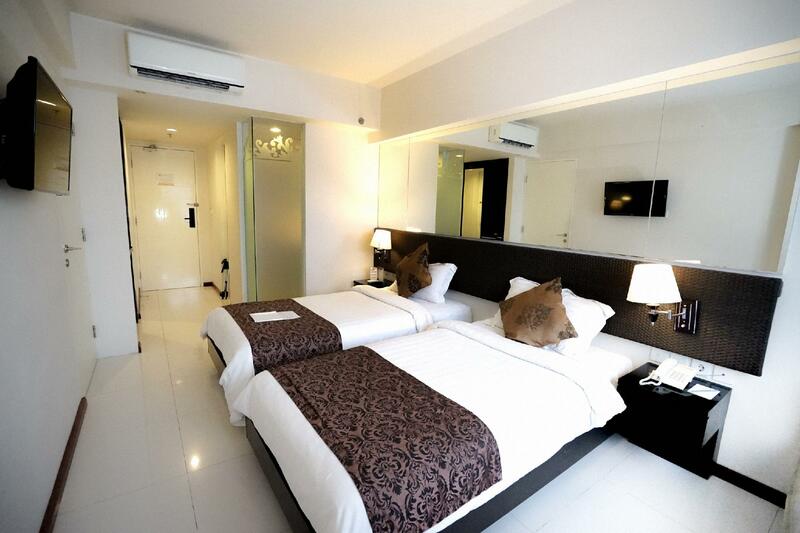 "Pros : walking distance from airport, nice hotel, pool Cons..."
Have a question for Solaris Hotel Kuta? 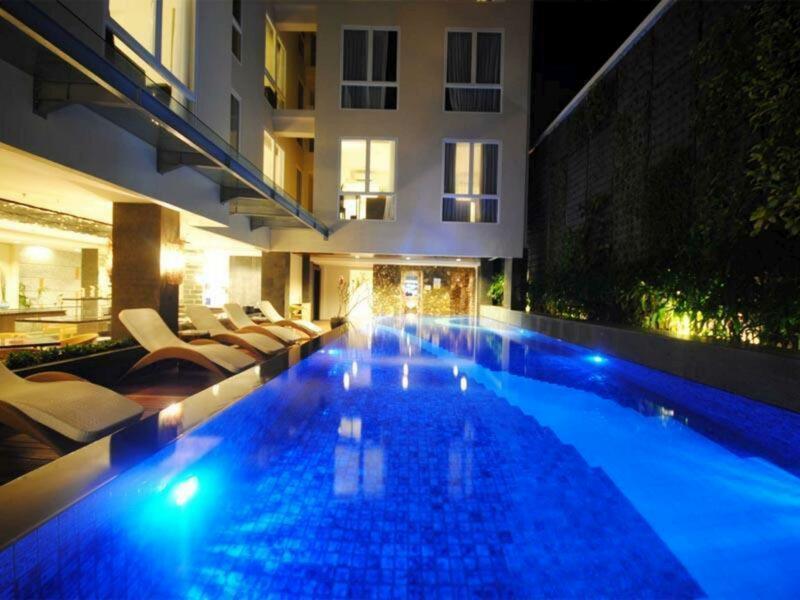 "I think this is a great hotel to stay in Kuta area." "A good hotel and clean"
"The accommodation fee is reasonable." Planning an incredible vacation is easy when you stay at the Solaris Hotel Kuta. Located only 10 km from the city center, this hotel is the perfect place to stay if you want to explore everything there is to do here. It has an outdoor swimming pool, a spa, and ticket services, among other great facilities. 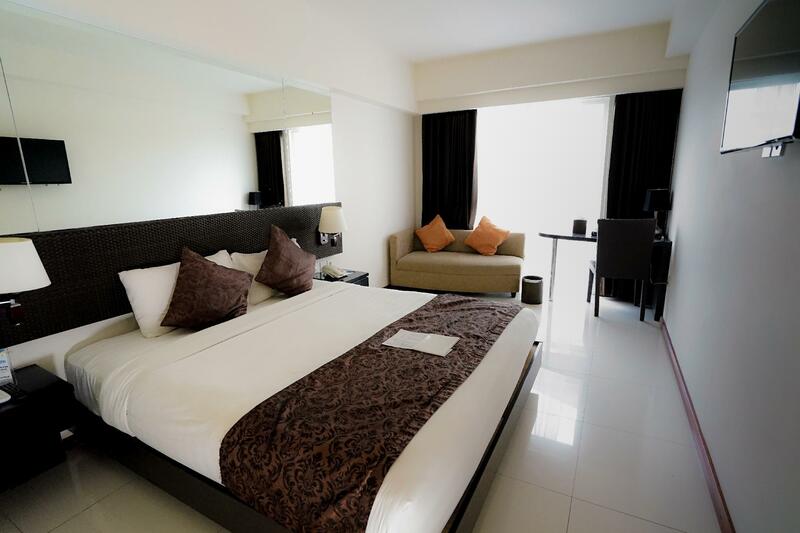 The Solaris Hotel Kuta has several convenient features, such as safety deposit boxes, an infirmary, a smoking area, as well as a currency exchange. It is close to msc mega sari, Lippo Mall Kuta, Anika Tailor, Wake Bali Art Market, and Gereja Katolik Santo Fransiskus Xaverius. Equipped with a bar, it is ideal for anyone who enjoys a breakfast mimosa while on vacation. It has a pool, which is suitable for keeping the whole family entertained. The Solaris Hotel Kuta gives you access to a variety of transport options, such as airport transfers and car rentals. From dry cleaning services to daily housekeeping, the hotel has various useful services for guests to utilize. It has a bar, a coffee shop, restaurants on-site, BBQ facilities, and a poolside bar, so guests can choose to eat in or grab something small to munch on. With Indonesian, American, and Asian restaurants nearby, it is in a great area for those who want to enjoy delicious cuisines when eating out. Have a delicious meal at Warong Miyabi, Caviar Cafe, Bubba Gump, Excelso Cafe, Infamy or other restaurants nearby. Offering guided tours, the Solaris Hotel Kuta is the perfect place to stay to learn about the area. If you want to spend your day simply relaxing and unwinding, get a massage nearby. 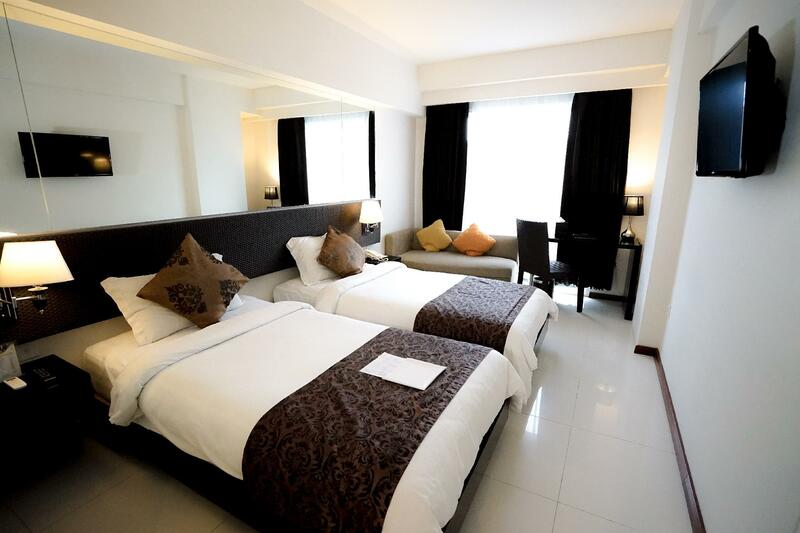 The Solaris Hotel Kuta features family rooms, so your family is provided adequate space to be together. There's free Wi-Fi available in all rooms, as well as Wi-Fi in common areas, so you can easily stay connected to your friends and family back home without overspending on international charges. The Solaris Hotel Kuta provides an express check in and check out service, enabling you to avoid waiting in long queues when getting ready to catch a train or plane. The front desk is open around the clock, ensuring that there is always a member of staff behind the desk to help you with any queries. Hotel staff speaks English, Greek, Portuguese, Arabic, Russian, and other languages. The Solaris Hotel Kuta offers check-in from 02:00 PM and check-out until 12:00 AM. It’s in the road to Jerman beach (4minutes),smiling & friendly staff, It ‘s a small room but will feel like a bigger better room(design excellence), a small table a sofa , wardrobe, refrigerator (not working). I’ll love to live in such spaces , I’m a fan of well designed small rooms . Not a good value for money very small rooms, welcome drink was noted as non alcoholic, 8am in the morning was refused a coffee. Ended up with iced tea. Building old congested parking at the front entery. Went around the corner next day to.the Tusita Hotel cheaper next to.Lippo Mall very friendly staff.and big rooms with balconies facing main shopping strip. When I was booking this hotel , I read all the review of this hotel ( people comment cleanliness is very bad , staff is rude) but I still book this hotel because I think that maybe some room dirty only. Unfortunately, I get a very bad room as other comment too. AC not work, so dirty, staff is rude. Check in at 3pm ++ !!!!! Late than one hour ( should be check in at 2pm) it affect my schedule. Never and Never stay at this hotel. Disappointed ! The hotel is dropping off in a few areas. Breakfast choice and cleanliness is suffering. The happy hour is the worst in the area. The booking site formulas are hurting business. Ie Agoda indicated s high price for mon to fri despite only 25% occupancy. This was due to a busy weekend. The formula is bad for Solaris business. It’s in Kuta where you can shop and the bed are so big enough to fit 3 people. The room has a couch, tv, hair dryer, toiletries. You’ll definitely like it! Great value for your money. Would stay here again when I go back to Bali! Value for money + amazing stay! Spent 4 nights in Solaris Kuta and I must say when i go back in Bali we’ll be staying back here again! Gave 3 stars for cleanliness as we had a little issue with some stains and itchy sheets though to be fair they changed it quickly and they make sure your room is cleaned everyday. my family and I stayed in the superior room and we were grateful for a small couch for one of our kids to sleep on. the hotel is close to the airport (try to take a grab not an overpriced taxi!). the staff is professional and helpful and the lobby is nice. our beds were quite uncomfortable and the room felt tired and not very clean (found a cockroach which is not that uncommon in Indonesia). you can hear everything happening in the hallways which is unfortunate since it's a bit of a party area. there are some great restaurants in walking distance (Johnny tacos!!) and some awesome massage palors and shopping right across the street. all in all in was a pleasant stay. bed is big. great location. walking distance to nice calm beach of 'Pantai Jerman'. many nice warung with local food nearby. breakfast is sufficient. good value for money. the only minor thing during our stay was we could hear sound from downstair rooms, because the window face the road is with same 'wall'. But it was not that long. we slept very well there. will go back again to this hotel if visit bali. I booked 2 rooms with extra bed, arrived at the middle of the night, and with no confirmation at all, they have the rooms setup nicely...!! Well Done...!! Appreciate that much...so we can just hit the bed for rest. I enjoyed my morning run, as this hotel is really close to the Beach... so I ran from Jerman Beach to Kuta Beach.. sooo niceee.... This hotel might be my choice if i come to Bali again.. the value for the price is just so right. Breakfast varieties not many and taste have to be improved a lot. That's the only thing I cannot compliment. Me and my partner and our family and friends have traveled to bali 9 times over the last 2yeasr and the staff was always the high point of the Solaris, friendly, funny, nice and very accommodating. This time however new staff was everywhere and they were rude to me and not friendly and dismissive. This is sad for me as the price, location and old staff where amazing. Walking distance from airport and Kuta Beach. Everything you need close by, but still l away from the busy and noisy streets of Kuta. Location is great because near Ngurah Rai Airport, Lippo mall and Discovery Mall . Great welcoming and friendly staff. The big room was clean and tidy with beatiful decoration facing swiming pool. We stayed in highest floor. Best Value and I really recommended this hotel. I would like to say thanks to Tina from Solaris for upgrading our room, from superior to deluxe room for our honeymoon trip. We didnt been mentioned about the decoration with roses,and we love it so much.